It's Christmas time in Emerald Springs, OH. 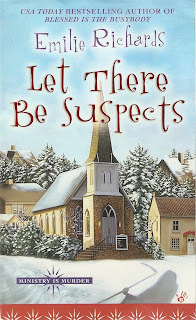 The Wilcox's are eager to put the last year's murder behind them and enjoy the festivities with her family and sisters (Vel and Sid), until her mother, Junie, invites an uninvited guest, Ginger (their foster sister). Ginger rubs into her foster family's face about the success she's become and, once again, puts herself front of attention. Sid reacts horribly and Ginger winds up wearing eggnog and Aggie's lost another punch bowl. That alone is sacrilege. Christmas Eve arrives along with the huge ceremony, but the plans take a bad turn when Ginger is found in the manger, dead. Aggie takes it upon herself to find out who did Ginger in, especially after Sid's under suspicion for the crime. As Aggie digs deeper into Ginger's past, she finds no shortage of suspects and uncovers things about Ginger that are very unsavory, but worth killing over? At least one of the secrets. A quick read with good characters. I like Aggie Sloan-Wilcox. She's not too witty, she seems very believable, especially the interaction with her family, she just happens to run across bodies and murderers. This is the second in the series and it's been awhile since I've read the first, so I can't really go into too much about the beginning. The first book introduced Aggie, Ed (her husband), Deena and Teddy (their two daughters), Lucy (who's Aggie's best friend, partner in crime solving, and business partner in house-flipping), and a gaggle of the women who support the church Ed is minister for. While I figured out early who did it, I was off a little on the reason the murder occurred although I had a different reckoning (all those Forensic Files shows will be the ruin of me). Still, it's good enough to continue the series. did you figure out whodunit from clues in the story? i enjoy crime mysteries where the reader has a chance to solve the murder from attention to details along the way. i've read other murder mystery books where, right before the end, the author introduces some obvious clue, or a new character who's obviously the perp. i prefer the former to the latter, although it can be a boring read if i know who did it, and there aren't any red herrings to throw me off. I figured out based on suspicion. The author threw in some other characters who definitely had motive, but not really the means, opportunity, or desire. The reason was different than what I thought it would be which is what threw me off. I was correct, but not for the reasons I thought. I typically don't like the books where the villain arrives at the last minute or the sleuth doesn't really figure it out, just happens to be there with the killer. I like to solve with the details, though I don't like them to be so obvious as I do like challenges.